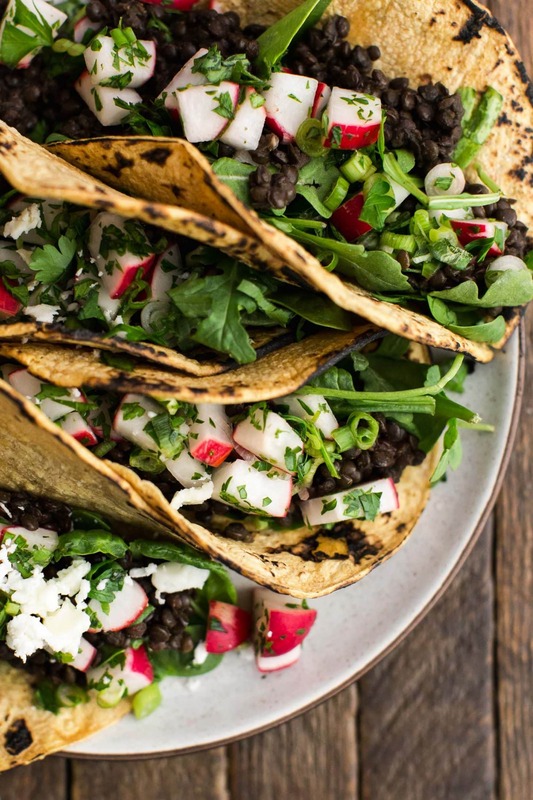 Spicy Lentil Tacos with Radish Salsa | Naturally. May is one of the best months because it’s officially the open of many farmers’ markets across the United States. Fresh produce is everywhere and it’s one of my favorite ways to get new recipe inspiration. When Frontier Co-op asked how I use farmers’ markets to Cook with Purpose, I knew I’d be making tacos. These tacos highlight two of my favorite spring treats: fresh baby greens (like spinach and arugula) and crisp, red radishes. The freshness of the greens and radish salsa balance the spice-forward lentils. A perfect spring meal that is easy to throw together and highlights a couple of my favorite farmers’ market treats! Easy vegetarian lentil tacos that are topped with a fresh, spring radish salsa. Prepare radish salsa according to directions, set aside. In a sauce pan, combine ingredients for the taco filling, without the salt. Bring to a boil, reduce to a simmer, and let cook until lentils have absorbed almost all of the liquid and are tender, 25 to 28 minutes. Heat tortillas, either in a damp towel in a warm 200˚ F oven or use a gas oven burner to lightly char the tortillas. 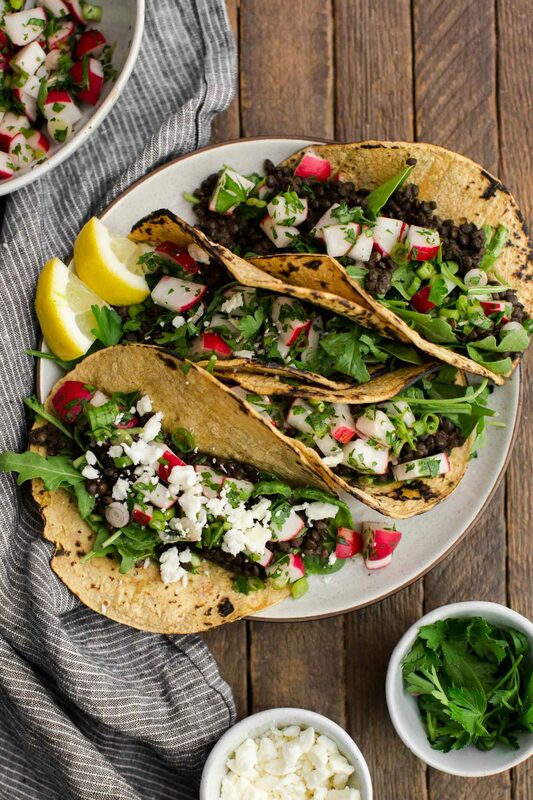 Assemble the tacos with a handful of greens, 1/4 cup of the lentil filling, 1/4 cup radish salsa, and a sprinkle of feta cheese. Tips & Tricks: Make the radish salsa ahead of time for the flavors to come together. While it’s easy to turn to black beans for vegetarian taco fillings, I love spicy lentil tacos. The lentils soak up all the flavors while cooking and when it comes to black lentils, still have the perfect amount of texture left after cooking. I’ll cook up an extra batch of the lentils and eat taco salads throughout the week- a perfect lunch in my book. Salsa: This radish salsa is a favorite way of mine to use up spring radishes. However, if you’re in the throws of summer with no radish in sight, I highly recommend this roasted tomato salsa. Vegan: An easy variation- just skip the cheese. I like the flavor of salty cheese on my tacos but you could easily just leave it off the taco. Cilantro/Lime: One of the things I love most about these tacos is the fact that they don’t have cilantro. I’m a cilantro lover but I know many aren’t- the lemon/parsley still adds the bright citrus and herb flavors without using the traditional taco herb. You could, however, switch it up and use lime and/or cilantro. While I could have highlighted any of the spices from the tacos (all the Frontier spices are great), I chose cayenne because it’s the perfect way to add a little kick to meals without being overwhelming (and even my spice-avoiding husband loves it). 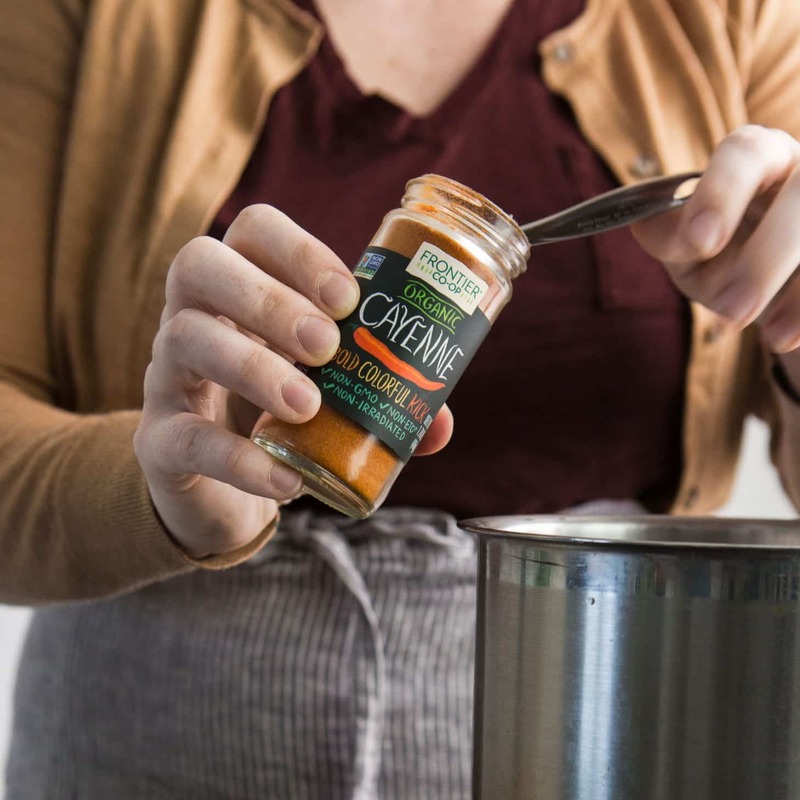 I love to use Frontier’s Cayenne Pepper in chilis, soups, and especially in enchilada sauce. Lovely char on those tortillas! Lentil tacos is something that I’ve started to see popping up on my Pinterest feed, pretty interesting take on tacos I must say. I love the farmer’s market too. I like to go there and stock up on produce before I menu plan so I know what I have to work with that week! The radish salsa looks like a great compliment to tacos! these look amazing. I usually use lentils in my tacos but this is a great idea for trying them a different way! Made these last night and they are SO great! Great use of all those beautiful radishes at the market right now… thanks for sharing! I don’t see the recipe for the radish salsa?